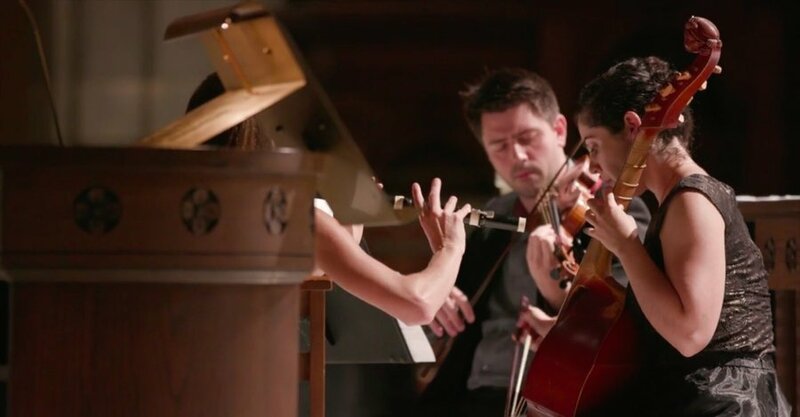 Hidden behind the harpsichord, Cantata Profana sent shooting star violin counterpoint into the sanctuary. A woman lit stand candles and two tables of votives. Each flame was preceded by a click from her lighter, and each step across the marble platform was an event. Her 30-odd clicks and strikes were wry additions to Kristina Wolfe’s Antiphon that sharpened the program’s contrasts: The Church of St. Francis Xavier website listed it as “a serious evening prayer service with instruments and soloist,” but the event was in fact presented by MATA in its initiative to welcome new sacred music into dialogue. So what were we doing? The young couple next to me in the pew neither knew of MATA nor were serious musicians (he admitted to playing percussion for fun), but new music and Wolfe’s pilgrimages were “their sort of thing.” The New Yorker description intrigued them enough to come solely for Antiphon. They were right to sense Wolfe’s import: despite her brief clock time, Wolfe provided the program’s philosophical shape. An antiphon is usually a sung text fragment indicating the viewpoint that is fundamental to understand upcoming liturgy; Antiphon did the same for Emil Wojtacki’s Compline (Ángeloi). 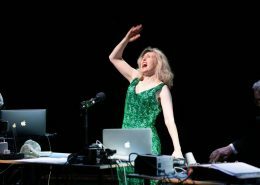 Wolfe’s music counters scientific time measurement by reclaiming a sense of time as embodied interaction. Some examples Wolfe gives of simple day in this ancient sense: not 9-5 but “eat breakfast, eat lunch, eat dinner, go to sleep.” Likewise “Divine Mysteries” was one seamless event: no progression markers of applause but cyclical sit, stand, sing, stop singing, sit. “Divine Mysteries” makes sense after MATA’s “New Music from the Islamic World” series premiere in 2017. 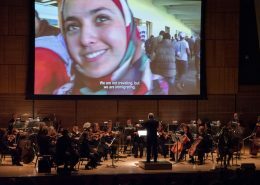 The inaugural program was presented in the wake of President Trump’s travel ban, which predominantly affected Muslim countries. MATA offered a dignified, nearly nonchalant presentation of geography and collegial welcome, but neatly ignored politics and religion. 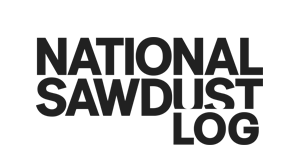 Poland is one of Europe’s most religious countries, however, and MATA’S Sept. 14 collaboration with Saint Francis Xavier and its performing arts series, Polska Music, and the Adam Mickiewicz Institute is part of the initiative to take the thing on. The woman who lit the candles, it turned out, also anchored Compline. 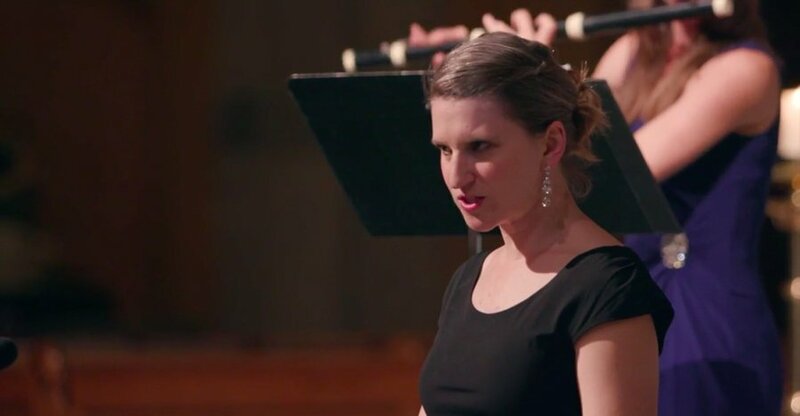 Soprano Jessica Petrus transitioned seamlessly through the work’s Latin chant, melismatic waves, and microtonal portamenti. Compline is a Roman Catholic evening prayer service that emphasizes peace and contemplation, reflecting on the day and inviting the sacred into its appraisal. This intricate prayer liturgy shaped the piece’s linear progression, but aside from highlighted Psalm phrases about peace, text painting was sparse. Instead Wojtacki unified the work with sophisticated balance and elemental counterpoint between Cantata Profana’s Baroque instruments and Petrus’s tour de force; consonance and dissonance; measured and microtonal pitch; fixed text and discretionary pauses; pedal points and harmonic progression; lush washes of sound and spiky texture; restrained accompaniment and ornate, fluid Latin. Sudden extended techniques on the Baroque instruments, a droning cello, and microtonal shimmer at the mention of angels in Jewish poetry pulled the past and present in opposite directions. Todd Tarantino, MATA’s director, noted that Wojtacki wished the work to be experienced as a liturgy, and that the program would respect that wish. The word “liturgy” is somewhat contested in religious circles – whether it is work done by divine or human agents, and for what purpose – but regardless, it did involve work. 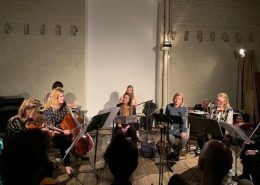 The audience was asked to move, sing religious concepts in Latin, and read and listen for cues as a both a sign of respect to the composer and an opportunity for embodied experience. Within so formal and predestined a participation I became acutely aware of the paradox of performance, with its unpredictable ratios of respect and sacrifice. 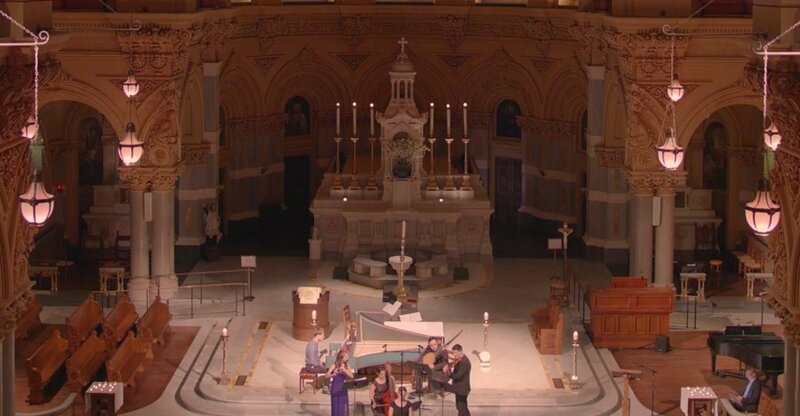 My discomfort sat between recent headlines about the Catholic Church, the composer’s wishes, and the respite from urbanity that architecture and a shimmering sacred plane provided, despite car horns interrupting – in exact harmony – a few times. Lana Norris is a music journalist and collaborative pianist with a background in sacred music and religious studies. 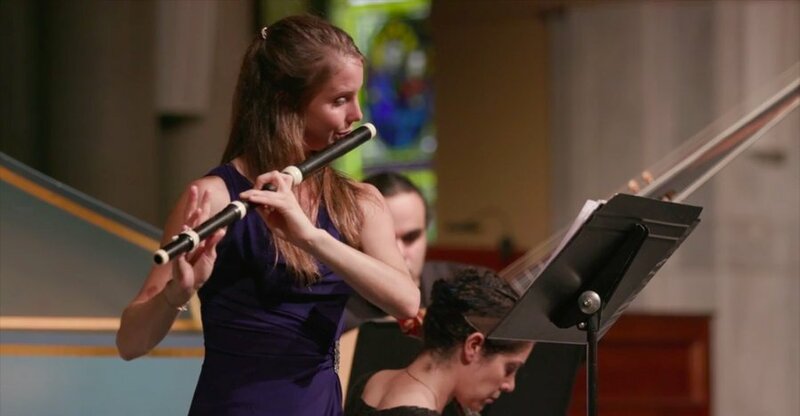 She brings an interest in diplomacy to her dedication to contemporary concert music.